Let’s Not Wait For The Next Convention! Question: I feel that we can increase the speed and raise our unity to its true height without waiting for the next Convention. How can we do that? Answer: We are not waiting for the next Convention. We must overcome all the gaps and distances right now. Every person must imagine the place inside of him where our desires unite, and inside them we will reveal the spiritual world, the Creator! Our common effort to unite together through our desires, our points in the heart, and the demand for the Creator to be revealed between us and to unite us, will make it happen. We don’t have to wait for a Convention to make it happen! Question: In the book A Vision of Goodness, it is written: “And know that man has to study the four levels of PARDES: Pshat, Remez, Drush, Sod, and reincarnate until he fulfills them.” Do we really need to go through so many reincarnations until we learn the entire PARDES (the simple explanation, the allegory, the hint, and the secret), in order to reach the end of correction? Answer: We need to reach “Pshat,” the simple explanation of the Torah. So far we have been studying “Sod,” the hidden, secret meaning. “Sod” means that I am studying, but I understand nothing; it is a secret to me. “Pshat” is the greatest attainment, when there is no concealment at all, and everything is clear, open, simple, and obvious. All the Lights fill all the Kelim (vessels), I know and understand everything! Every person needs to attain this in his or her soul, but on his own level, until his complete correction. Question: How do we resume the aspiration for spirituality after the Convention? Answer: At the Convention you felt an obstacle that is getting in your way – Pharaoh. This was the first time you encountered it and you understood what the ten plagues are: We want to achieve the connection with others, but we are being pushed back. Now we need to understand that in response to the blow that we received, we must develop our own desire equal to the force of rejection. This only comes through unity with the friends while studying, where our study becomes an appeal for the unity of desires. We already have a deficiency and impression from the collision with egoism (Pharaoh), the egoism that separates me from spirituality. It’s as if I literally hit a wall that’s between myself and the Upper World, and this wall is that potential negative force that has pushed me back. I received a blow, but I have to discern that I am egoism, and if I am able to rise above this blow through faith above reason and develop an opposite force, then I will advance into this structure, into the wall. Then the next blow will come, and so on, and this is how I will pass the Machsom (the barrier that separates us from spirituality), which has five levels of depth (Aviut) or ten Sefirot, just like any phenomenon in spirituality. We have already begun this attack, and every time it will become clearer to us what we need to attain and what we need to fight. Now I need to distinguish the disappointment, pain, the blow, and the rejection in me, and instead of relating it to me, relate it to the Pharaoh within me. When I am united with the group, the blow does not hit me, I am above the rejection and disappointment. This helps me distinguish the “I” who strives towards the Creator and the Pharaoh (the “I” in me). But what should I do with the disappointment and helplessness? Ask the Creator for help! I finally need Him now, but not before. Before we used to think that we can attain unity with the group, the mutual guarantee, and the revelation on our own. We never accepted the Creator as the third main force which does the entire work. That is what it is called: the Creator’s work (Avodat Hashem). We only evoke it. Until the end of correction (Gmar Tikkun) we operate within the ten Sefirot of our soul. First of all, we must cut Malchut off, meaning to exclude from operation the desire that cannot be corrected. Moreover, we cut desires until Yesod, and we only work with those Kelim that lay above it, to the extent of our ability to incorporate them into Bina. This is the “union of circumcision”: We deactivate the desires that cannot be used until Gmar Tikkun. They will only be corrected at the end of correction. But we can receive Light for the sake of bestowal in all the other Kelim (vessels) from Keter to Yesod. …as it is said: “From my flesh I shall see the Creator.” Specifically “from my flesh,” because every time man signs the covenant of this union, he sees the Creator there. “From my flesh” means from the receiving Kelim. The bestowing Kelim are located above, until the middle of Tifferet, and the receiving Kelim that are called “flesh” and “skin” are located under them. It is only possible to see the Creator, that is the Light of Hochma (Wisdom), in the receiving Kelim, but only on the level of the “flesh” (Basar). We do not even touch the “skin.” In other words, we stop at the third stage (flesh, meat, or Behina Gimel), and we do not engage the fourth stage (skin, Behina Dalet). The wisdom of Kabbalah teaches us how to correct the desire that represents the entire matter of creation to a degree that we start sensing the Force that permeates the universe: the Creator (the Light). There is nothing except this Force and desire. Revelation happens in accordance with the law of equivalence of form: Desire feels the power of the Light to the extent of its correspondence to it. Full revelation of the Light is the program and the purpose of creation. It means that we have to correct ourselves to a degree of complete equivalence with the property of the Light: bestowal. Keter, the upper Sefira of Malchut, is above the Parsa, in World of Atzilut, where bestowal is in effect. The property of reception acts below the Parsa. Malchut receives the forces from Zeir Anpin. For us, Zeir Anpin is the Upper One, the giver; we receive everything from him. 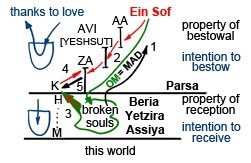 In its turn, Zeir Anpin is connected with the higher Partzuf of the World of Atzilut, Abba ve Ima (AVI), a part of which is Yeshsut. Below, there is the Partzuf of Arich Anpin (AA), which receives the Light from Infinity (Ein Sof) and passes it down the chain to Malchut. The major issue for us is how we (the broken souls that live in the Worlds of BYA) rise to Malchut de Atzilut. By including ourselves in it, we begin to take part in the process of correction. The World of Atzilut corrects broken desires that bear egoistic intentions. The desire to receive is unchangeable; it is matter which cannot be altered. But desire can be used in two different ways: It can either be filled from the inside by receiving, or it can be utilized for bestowal. In the second case, the desire will receive for the sake of bestowal. It is possible only as an outcome of love and union with others. 1. We raise our request to get corrected (MAN). 2. The answer (MAD) returns back to us in the form of the Surrounding Light (Ohr Makif) that empowers us. 3. We rise upward to Malchut de Atzilut. 4. Malchut delivers our request to Zeir Anpin. 5. Zeir Anpin gives Malchut powers and corrects the souls. Thus, all we do is work with the Light. Our work is intended to attain union among us in order to correct our desire by applying intention to bestow to it. This becomes possible only as a result of the Light’s influence. Question: What is better: reading the original Hebrew text during a lesson without understanding it or reading a translated text? Answer: This is a big question. In general, the Kabbalistic lexicon is so limited that students gradually become accustomed to it. We are talking about approximately a couple of hundred words that allow you to understand the Hebrew text. We see it in Moscow group which reads original texts in Hebrew. I don’t think that in the future any person who pursues the goal will study Kabbalah in any other language. It is very hard. We haven’t learned the Hebrew letters yet and haven’t started studying their external or internal meaning. Knowledge of the Kabbalistic language is extremely helpful. I am sure that you already know half the major terms in Hebrew, and can assert that you won’t be able to abide without understanding the original text. Yes, it is not simple. We are talking about an unusual language that is very different from Latin. But there is nothing we can do about it, the Light descends to us from right to left, that’s why in Hebrew the direction of writing is the same. Besides, we write the letters from right to left and from top to bottom, according to the direction of the Lights of Hassadim (Mercy) and Hochma (Wisdom). All letters consist of these elements. Their shape is defined by various combinations of the Upper Forces. All linguistic rules and grammar also have a spiritual foundation. They are built on interaction of Bina and Malchut. There are no rules in Hebrew that are invented by human beings. Since Adam’s birth 5772 years ago to this day, nothing has changed in the language, neither written nor verbal. If you met a person who lived thousands of years ago in Egypt or Babylon, you would understand each other with ease. Everything depends on the Upper root which is unchangeable. Laws of interactions between Bina and Malchut are eternal, and that’s why the language doesn’t undergo any changes. Other languages transform according to the mentality and ethics of the people speaking them. A thousand years ago your ancestors used language that you would hardly recognize today. Spelling and the external form of the letters themselves also change with time. However, Hebrew is not a human language but a projection of the Upper Forces and their combinations. Even though it is not convenient for contemporary people to use Hebrew, we have no choice. Kabbalists cannot convey Kabbalistic knowledge any other way.